The Fuller Center for Housing of Nigeria has been The Fuller Center’s most productive partner in Africa, especially near the capital Abuja where the organization has built more than 90 homes in a single community — Luvu Village, known locally as GrandLuvu Estate. 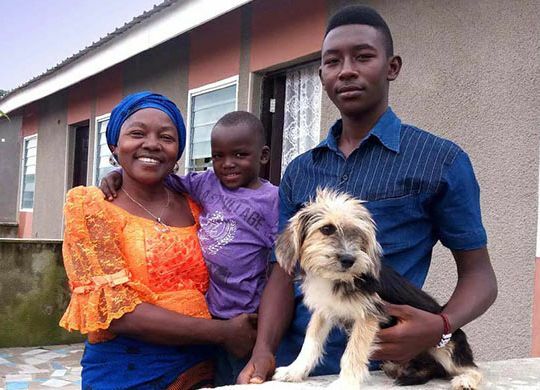 Fuller Center Nigeria is featuring the families of Luvu in a series of articles on its website, including the story of Naomi Luka below. For more of these family stories, visit Fuller Center Nigeria’s website here. (Fuller Center for Housing of Nigeria) A single parent, mother of four boys and grandmother of three, Mrs. Naomi Luka hails from Plateau State, North Central Nigeria. For 16 years she worked as a staff of a foremost Nigerian Bank in Kano, and in 2006 she lost her job with the bank as a result of the banking consolidation that took place that year. With all that she had left, she went into trading. She traveled several times out of the country to buy goods which she sold, but this could not be sustained as she ran out of funds. Thereafter, the business folded up. A trained and qualified teacher, and now in search of a job, Mrs. Luka relocated to Abuja in 2011 and had stay with her brother who lived in Masaka, close to the Federal Capital Territory. A few days later, Mrs. Luka along with her brother and his son attended the Public Information Seminar (PINS) organised by Fuller. “I had never been so convinced. From what I heard at the seminar that day, it dawned on me that with my little salary, I could afford to have my own place. The prices for which the houses were to be sold sounded too good to be true,” she said. She quickly fulfilled the requirements and was given the keys to her home.